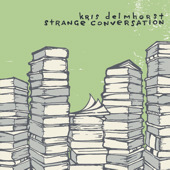 Kris Delmhorst was inspired by the work of well-known poets (Walt Whitman, Robert Browning, E.E. Cummings, Lord Byron, George Eliot and Edna St. Vincent Millay, etc.) to compose the songs on her latest album, Strange Conversation. "Some of the poems are set verbatim to music, some dismantled and reassembled in significantly new renditions, others merely used as the jumping-off point for Delmhorst's own literate lyrical take." lyrics adapted from: Walt Whitman, "A Passage to India"
Steer us to uncharted waters, hoist the anchor, shake out every sail. Why should we not go where all maps fail? lyrics adapted from Rumi, "Where Everything Is Music"
Today you wake up sad and empty, don't go back to sleep. There's a million ways to kneel and kiss the ground. There's so many more just waiting to be found.